Do you need to protect yourself or your business? Are you properly insured as a contractor? Having the proper insurance policies and coverages are essential to any big build, or construction project. Insurance for contractors provides vital coverage for many types of professions that may experience risks for potential losses, such as bodily injury, property damages, and other issues or claims. Proper protection against these liabilities could prove both necessary and beneficial in gaining clients and their confidence in your work, and having an excellent and dependable company provide you with an affordable insurance policy such as PJO Insurance Brokerage, is possible for you! Contractor’s insurance also helps establish credibility for your service or business, as customers are more likely to go with insured service providers. While we understand that you may know your profession as well as it’s processes in and out, all while following the proper safety techniques regularly, you can’t always predict or prevent accidents from happening, and you certainly do not want to be responsible for all of the possible liabilities and financial losses. You can be prepared for these potentially devastating events by maintaining solid Phoenix contractor’s insurance through PJO Brokerage! Reducing you and your company’s exposure to loss is pertinent to any thriving business of contractor! And Surrounding Cities in Arizona! We also provide other coverage and insurance services to help you prevent these losses and to allow you and your business to thrive worry free, knowing you are totally covered! Typically our premiums are affordable and competitive, and vary per profession. There are three parts to Phoenix Arizona contractor insurance coverage: the coverage plan, the policy to cover the company or the employer, and coverage to protect any individual affected openly by performing work as a contractor. These categories now present a total protection option especially during accidental damages resulting from property and equipment failure. 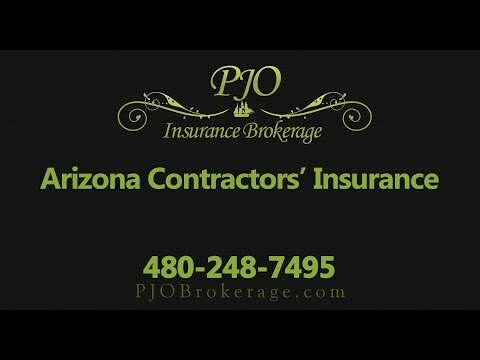 The PHX contractor insurance also offers full liability security that covers legal, compensation, and medical costs. On the other hand, this type of Phoenix business insurance does not cover negligent errors or acts especially those that are deliberate. This also does not give extended coverage for those that have demonstrated a pattern of careless behavior consistently. In all fairness to this insurance policy, it is very comprehensive due to the fact that it provides you as well as the company a safety net whenever possible. Don’t wait until it’s too late to get the proper insurance coverage you need to protect your business! Contractor’s insurance policies in Scottsdale AZ are affordable and necessary to all contractors! Contact us today at 480-248-7495 and let us help you get the city of Phoenix insurance you need!! Contract business owners are fully aware of the potential for accidents in their line of work, despite their meticulous planning and preparation. To add up, a range of scenarios may lead to on-the-job accidents. Due to all of these probabilities, it is essential for contract business owners to have general liability insurance in Phoenix to safeguard themselves from potential lawsuits. When shopping for contractor insurance, keep in mind that not all liability insurance plans are designed equal, and it pays to gather at least three insurance providers prior choosing one you will be working with. Some policies need coverage on all of your staff and you should accomplish proof of insurance from any subcontractors you will be recruiting. Insurance for Phoenix contractors is a great tool to protect your company’s best interests. Depending upon your policy, it may cover issues that occur for a particular time frame succeeding the project’s completion.